This is a pretty ballsy move, I must say. 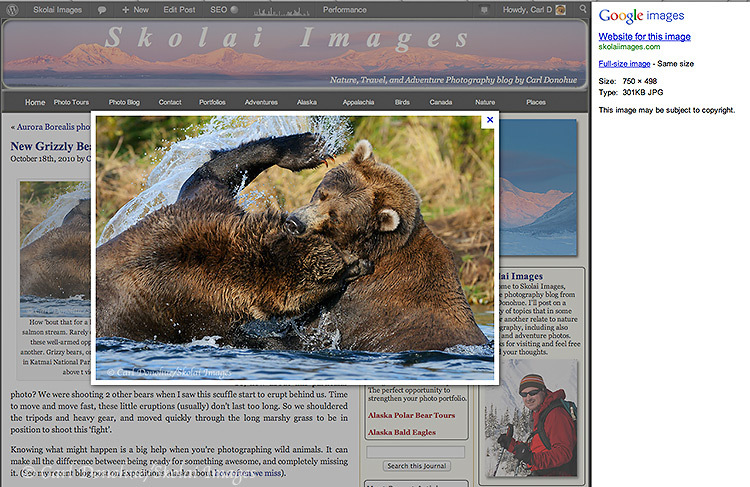 There’s been quite a bit of chatter around the ole interwebs about the new google images, on various web masters forums and so on, as well as some of the social media. Twitter, Google plus, etc. See Official Google Rollout, or Webmasters World. Safe to say, a lotta people are peeved. I’m surprised no one has mentioned this (that I’ve seen, anyway). If you’re unsure of how this might be a problem, think of it in terms of non-photo content. Let’s say the new york times have a great article on cool Alaska widgets. Their reporters did weeks of research, put together an awesome article, and they finally published on nytimes.com. 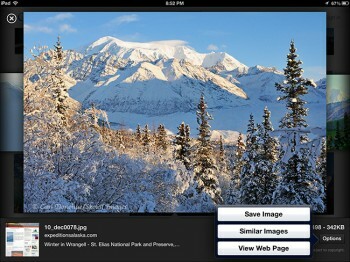 Now you do a google search for cool Alaska widgets and first up in the results is the nytimes article. You click on the link, and instead of being directed to nytimes.com, you stay on google.com and they simply display all the information from the article, with a “save as pdf” button beside it. The folks at nytimes would be reasonably, quite upset. This is exactly the same thing for photo content. Google, instead of sending traffic TO a website, are bringing content from a website to google visitors. Which is completely unreasonable, unethical, and downright shady. Shame, shame, shame on you, Messrs Page and Brin. 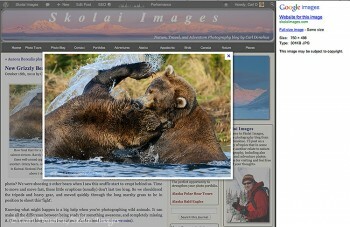 Screen shot showing how google images previously displayed images. You can see here the image display pops up overlaid the source webpage the file comes from; my breathtaking blog. 🙂 The image being displayed here is about 600px wide — less than the actual file size of 750px wide. But the key things, I think, are the difference in the interface. Here, clicking on the “x” takes the visitor to the webpage displayed underneath the file – the only way to return to google is hit your back browser. Most people won’t, they’ll hit the X, and be directed to my site. Which is were they should land, having just clicked on a link to my site in the search results (the thumbnail). This is as it should be. The visitor clicked a thumbnail for my image, which google create as a ‘snippet’ of my content; akin to me quoting a sentence or 2 from a longer piece of text. What’s not OK is for google to simply collate the content from around the web, store all of it on their servers, and then present that complete content as search results; that’s, plain and simple, copyright infringement. Of course, there are always gray areas around issues of copyright infringement; lawyers far more clever (and highly paid) than I will argue themselves blues in the face building ridiculous arguments to defend this. We’ll see how that goes, I suppose. The “Save Image” button, on the other hand, has to go. Google have no right, whatsoever, to offer, even encourage, google visitors the right to download my content for free, and particularly when that visitor now doesn’t even have to actually visit my website to do so. For that fact, google can should be ashamed of themselves. And they should take that “Save Image” button off their app right away. Google actually set an exciting precedent that leans in our favor with their settlement with the French news media.. It is a disgrace, however I don’t think Google is going to change their ways if the majority of customers are pleased and some photographers upset. Unfortunately the photo industry has proven to be toothless in enforcing copyrights in the past (unlike movie/music), which has probably to do with the fact that the most photographers are not professional and therefore do not care. Wow, this comes as a total shock to me! I’m so glad you brought this out, I would not have known! I think the whole photography community has to come together and do something about it, and do it soon! I saw that this morning – that case is a little different, from what I can tell, no? I agree that the issue changes drastically when the content providers have some clout; such as an organized media, as opposed to a bunch of photographers. Thanks @Rachel, I appreciate it. Hopefully some folks will make a good call, but I doubt it’ll happen. We’ll see. great piece, thank you for that. I think it’s the first blog post in English I read which criticises Google’s recent changes to image search. There’s already a huge debate going on in the German blogosphere about these changes although Google.de does not use the new image search (yet?). While I agree that this potentially violates creator’s rights there’s one thing I’d like to correct you: Google does not store the full sized image on their servers. They rather include it from the original web site and display it on their web property which doesn’t make it better in any way. Find this interesting, and if it is accurate, what you are saying, how can google get away with this!!! Not happy for sure!!!!!!!!!!!!!! Although I do respect what you say, I do believe that Google has very little to do on the “Save image” button as this is an embedded feature of the iOS system rather than something Mountain View branded. I don’t have anymore an iOS device so I cannot test myself, but I’m sure that if you surf a media rich site with some pictures, they will utterly provided with the “save as” button if you enlarge them or display with one of those overlaying techniques. Re the fact Google stores a local copy of the content on their server to later elaborate the content. Well, it’s called caching, and I bet you don’t mind if Google do it to let your site ranking in the SERPs. So apologies but I cannot vouch your opinion in this case. Remember, Google is trying to maximise the user experience first, and by serving the content from one location thus cutting off the time spent while loading. That said, have you noticed the “Images may be subject to copyright” label at the very bottom of the page? The writing on the wall is clear. Google is implementing features that scrape other peoples content and display that content within Google. The visitor doesn’t have to leave. They are encouraging those with websites to mark up their content with schema.org and rich snippets so they can easily parse and display data. This fits with the launch of Google’s knowledge graph in May 2012. Think about all the verticals Google has jumped into where you don’t have to leave their properties. Flights, credit cards, movies and so on. And yes, images. How can you guarantee people visit your site for your content? Paid advertising of course. Thanks for the reply. You’re right, they don’t “Store” the files on their server. But they do index it, and effectively store all that on their servers. Hence “google cache”. But no, they don’t store the jpg on their server; and I wasn’t clear on that delineation. Clearly, however, they’re storing more and more of the content they index, as is seen from the ‘previews’ they display when you mouse over a link on the “Web Search” results. My concern is their shift toward being a displayer of content, not simply a link to the source of the content. No, the Save Image button is a function of the google app; it’s not on any of the browsers at all. Of course, they do have their own version, and I think that’s bad enough; but at least in Safari, if you browse my website to view my picture, you’re actually ON my website when you steal my images. 🙂 The Google App doesn’t even require you to actually visit me website to do that. Regarding caching, no, if it’s a mutually benefiting process; and if the result is they send traffic to my website. But now it’s working much more in one direction; content providers are scraped by google, who serve that content to the end user; their intention is clearly to keep traffic on THEIR site, not forward it to the provider of the content. IMO. @Matt – I agree 100%. Well Carl, I tested yesterday this by borrowing an iPad from a colleague of mine, and the “Sve image” was there for all the sites I visited regardless the domain or the vertical. So I’m sure it was something belonging to Safari for iOS. Yes, you are right, traffic is on their site, but trust me. People who look for images are very likely tempted to go over and reach your properties if they are satisfied with what they have seen. Perhaps we can see this as a collateral to maximise our efforts as webmasters to provide more quality stuff? Re the objection on Paid search. Provided that I’m not a Google employee, we don’t have to forget they are a business company and they do have to do whatever is in their power to make sure balances turns positive at the end of the fiscal year. That said, we are talking of two different beasts. Things will be completely different when a Paid Image service will be launched, and trust me, that’s just behind the corner. No, this isn’t the Safari iOS; this is using the Google Search app. The button comes up in the ‘Options’ button in the Google Search app. Safari has its own set of issues; I don’t think they should have a “Save Image” button either, just as I think ALL web browsers should not have a right click ‘Download image” option .. but that’s an entirely separate issue. The issue here, as far as I’m concerned, starts with Google encouraging users download the image, without even so much as sending them to my website to do so. That, imo, is simply wrong. Oh Carl, apologies … I didn’t realise you were effectively talking about their mob app (though this is stated) as very few people uses it IMHO. Wow, this is an eye-opener indeed, as are the comments too. Makes want to consider blocking Google from my site and abandoning my online development for more traditional approaches. If Google isn’t careful, they might send content providers back to print media, which might not be so bad after all. I hear there have been several class action suits against Google and at least one against Instagram. Unfortunately, I found out by using Google. Also, from the comments above, the “Save Image” feature itself on many platforms is a larger issue. As far as how I understand copyright law, having a “Save Image” button anywhere on anything is illegal. The platforms who do are accomplices to image piracy. In 30-40 years if we haven’t burned away the water and atmosphere or blown ourselves up, all this will hopefully be sorted out and we will look back and laugh at the old days of the wild west internet. Unfortunately in this “wild west” the bandits are the establishment.